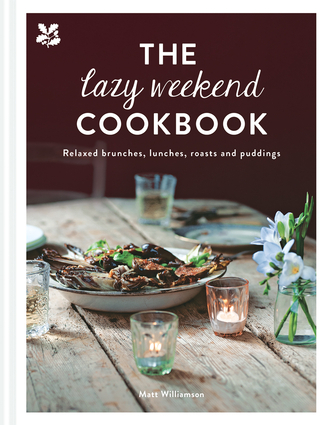 Weekends are the perfect time to treat yourself to some delicious food and in this new book chef Matt Williamson provides recipes ideal for any occasion—whether it is a lazy breakfast in bed, a healthy brunch, a leisurely roast dinner, or a quick Sunday supper. The book includes chapters on Breakfast, Brunch, Long Lunches, Roasts, Barbecue, Picnics, Easy Dinner Parties, and Bakes. The recipes range from brunch classics such as French Toasts and Omelette Arnold Bennett to tasty long lunches like Mussels in a Saffron and Fennel Broth or Persian-style Stuffed Shoulder of Lamb. There are lots of ideas for dining outdoors—from Jerk Skewers or Mexican Corn cooked on the barbecue to noodle salads and black pudding Scotch eggs for the perfect picnic. There are recipes for three-course dinners, perfect for a supper party with friends, and tasty baking ideas such as Ham, Cheese and Olive Loaf, Filled Thumbprint Biscuits, and Ice-cream Sandwiches. With 100 approachable and easy-to-follow recipes packed with flavor and drawing on culinary inspiration from around the globe, The Weekend Cookbook is the perfect way to discover new delicious and indulgent meals. Includes metric measures with conversion chart. Matt Williamson has over 20 years of experience of working in restaurants around the world, from two star Michelin restaurants to gastropubs and London bistros. His restaurant Flinty Red in Bristol won accolades from Michelin, Good Food Guide and Observer Food. His cooking style has been influenced by his extensive travels and he now works on various culinary projects, acting as a consultant for restaurants, developing new products, and in food education.